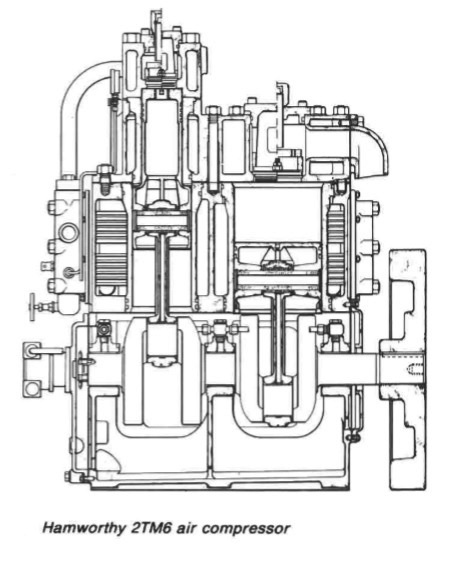 The compressor illustrated in Figure 1 below is a Hamworthy 2TM6 type which was designed for free air deliveries ranging from 183 m3 per hour at a discharge pressure of 14 bar to 367m3 per hour at 42 bar. The crankcase is a rigid casting which supports a spheroidal graphite cast iron crankshaft in three bearings. The crankshaft has integral balance weights and carries two identical forged steel connecting rods. Both the first and second stage pistons are of aluminium alloy with cast iron compression rings. Scraper or oil control rings are fitted to return to the crankcase, most of the oil being splashed on to the cylinder walls from the bottom ends. The cylinder walls are lubricated by the splashed oil The pistons have fully floating gudgeon pins; connecting rod top ends house phosphor bronze bushes. The bushes are an interference fit in the connecting rods and are so toleranced that the collapse of the bore when fitting is allowed for, to provide the correct running clearance. Steel backed white metal lined 'thin shell' main and crankpin bearings are used and all of the bearings are pressure lubricated by a chain driven gear pump. Air suction and discharge valves are located in pockets in the cylinder heads. 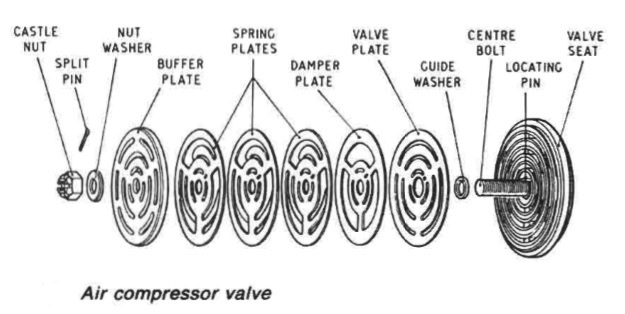 The valves are of the Hoerbiger type and are as shown in Figure 2 above. The moving discs of the valves have low inertia to permit rapid action. Ground landings are provided in the pockets on which the valve bodies seat. The bodies are held in place by set screws which pass through the valve box covers, capped nuts being fitted to the ends of the set screws. A combined air filter and silencer is fitted to the compressor air intake. The intercooler is of the single pass type. The shell forms an integral part of the cylinder block casting, with the air passing through the tubes. The aftercooler is of the double pass U-tube type. Again the shell is integral with the cylinder block. Relief valves are fitted to the air outlets of each stage and are set to lift at 10% above normal stage pressure. The actual stage pressures vary according to the application. To protect the water side against over pressure in the event of a cooler tube failure, a spring loaded relief valve or bursting diaphragm, is fitted on the cylinder jacket. Protection against overheating in the compressor discharge, is afforded by a fusible plug fitted on the aftercooler discharge head. Overheating sufficient to melt the alloy material of the plug can be the result of carbon build up around the discharge valve. 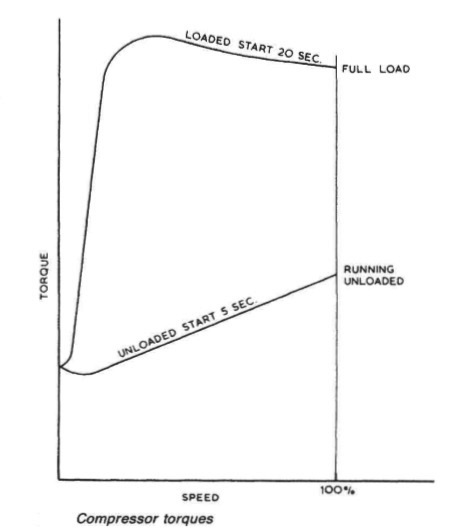 Compressors must always be started in the unloaded condition otherwise pressures build up rapidly producing very high starting torques (Figure 3 above). During running there is an accumulation of oil carried over from the cylinders and water from moisture, precipitated in the coolers. The emulsion is collected in separators at cooler outlets and these must be drained off regularly, to reduce carry over. This is extremely important, first to prevent any large quantity of water and oil emulsion reaching a subsequent compression stage and causing damage to a further stage and secondly to reduce the amount carried over to the air receivers and starting air lines. Moisture in air receivers can give rise to corrosion and despite the proper operation of compressor cooler drains, a large amount tends to collect, particularly in humid conditions or wet engine rooms. It is good practice to check air reservoir drains regularly to assess the quantity of liquid present. In extreme conditions, drains may have to be used daily to remove accumulated emulsion. This is very important if air for control systems is derived from the main receivers, to prevent problems with the reducing valve, moisture traps and filters. Moisture traps for the control air system also require regular checking and possibly daily draining. A compressor is unloaded before being stopped by opening the first and second stage drains. The maker's instructions normally recommend the use of a light oil for crankcase and cylinder lubrication. Diesel engine erankcase oils, which are likely to be a blend of light and heavy stocks, tend to produce deposits. The oil is inclined to emulsify and should be changed at frequent intervals. Excessive operation of automatically controlled compressors (usually due to a large number of leaks rather than actual use of air) usually means that valves require frequent cleaning and maintenance. Failure to keep valves in good condition, results in valve leakage and overheating with an associated accumulation of carbon on the valves and in valve pockets. The combination of carbon, excessive temperature and the high concentration of oxygen in compressed air can result in fire or explosion in the discharge pipe. The effect of fire in a compressor discharge, has been known to weaken the pipe causing a split through which flame, supported by the compressed air, has emerged, Poor valve condition can be detected by observation of the stage pressures and is usually accompanied by excessive discharge temperature although the latter can also be a symptom of poor cooling. Adequate attention must be given to the water cooling system. Overcooling can cause condensation on the cylinder walls, adversely affecting lubrication, while poor cooling, due probably to scale formation in a sea-water cooled machine, will result in a fall-off in volumetric efficiency and rapid valve deterioration. Inter- and after-coolers require periodic cleaning to remove scale (where they are sea-water cooled) and oily deposits from the air side. With respect to temperature limitation, classification societies require that the compressor should be so designed that the air discharge to the reservoir should not substantially exceed 93 deg C.